Learn what sciatica is, what the symptoms of sciatica are, and why sciatica is a bit tricky to deal with. Then learn about your treatment options from both medicine and physical therapy. Finally, explore our unique perspective on sciatica as an upper cervical chiropractic practice. It includes our secret behind sciatic nerve pain relief. (If you just want to jump to our secret for sciatica nerve pain relief, then click here. )If you’re looking for a second opinion related to sciatica or nerve pain down the leg, please use the contact form to set up a phone consultation. and it can be one of the most difficult conditions to resolve without proper chiropractic care. The sciatic nerve is the nerve that supplies nervous system energy to the muscles and skin of the lower leg. With this kind of nerve pain, you may feel the pain anywhere along the path of the sciatic nerve. You may have pain in the lower back, buttocks, lower leg and/or foot. You do have a sciatic nerve on both the right and left side of the body. But sciatica usually occurs on only one side at one time. This is perhaps the hardest thing to understand about sciatica symptoms. Sciatica itself is not a medical condition–it describes a set of symptoms that are caused by another health condition. So sciatica is never a cause of anything. It is just the result of something. Any condition that puts extra pressure on the sciatic nerve or the roots of the sciatic nerve can cause the symptoms of sciatica. And this is why it’s so tricky. 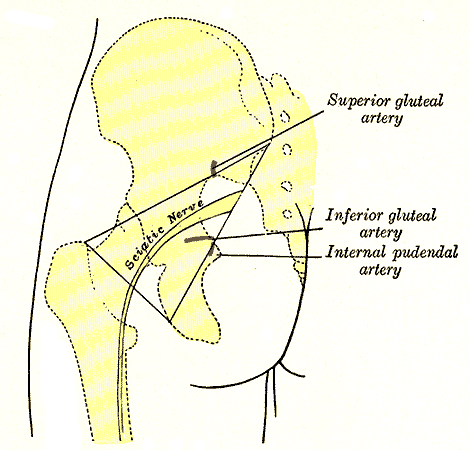 For example, a bulging disc or a extremely tight piriformis muscle (a muscle of the buttocks) can both cause sciatica. The sciatic nerve is the largest nerve in your body. The sciatic nerve emerges from the spinal cord in the lower back. It travels through the pelvis and then runs through thigh muscles on the back of the leg. Around the back of your knee it splits into two—and one half travels down the back of the leg into the foot. The others travel down the front and side of the leg into the foot. The sciatic nerve supplies sensation (feeling) to the skin of most of the lower leg and the foot. It also controls your leg and foot muscles. If you pick up your leg and look at your toes right now, you are using your sciatic nerve to do that. What are the the most common sciatica symptoms? These symptoms usually occur on one side of your body. Do you have any of these sciatica symptoms? All sciatica pain is caused by anything that puts extra pressure on the sciatic nerve (somewhere in the buttocks or leg) or the sciatic nerve roots, up in the spine. According to some experts the most common cause of this type of pressure is a ruptured/herniated disc in lower back. Some experts say that about 90% of cases of sciatica are caused by spinal disc herniation. Either the herniated disc itself or the swelling associated with it can lead to compression of the sciatic nerve. In some cases of sciatica symptoms, there is no identifiable underlying cause. When the doctor orders an MRI, the disc isn’t bulging (no spinal disc herniation). There is no obvious piriformis syndrome. There is no spinal stenosis. In these situations, your doctor may have a hard time explaining why you have sciatica. In that case it might be hard to find sciatic nerve pain relief if you don’t respond to typical medications. We will go over your sciatica treatment options and why upper cervical chiropractic is an option in our next articles.